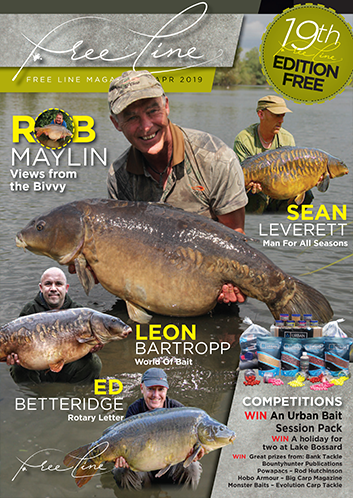 In the April 2019 edition of Free Line magazine we feature Ed Betteridge, Leon Bartropp, Sean Leverett and of course Rob Maylin with his 'Views from the Bivvy'. 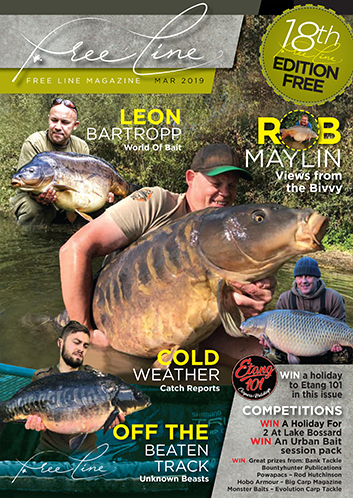 In the March 2019 edition of Free Line magazine we feature Leon Bartropp and of course Rob Maylin amongst others, along with Cold Weather Catch Reports and Off The Beten Track. 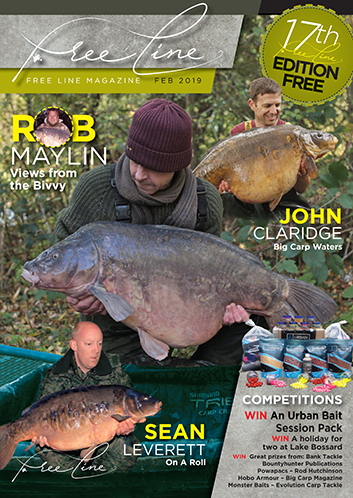 In the February 2019 edition of Free Line magazine we feature John Clardige, Leon Bartropp, Sean Leverett and of course Rob Maylin amongst others. 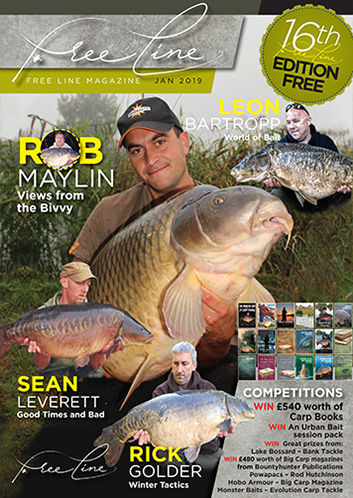 In the January 2019 edition of Free Line magazine we feature Leon Bartropp, Sean Leverett, Rick Golder and of course Rob Maylin amongst others. 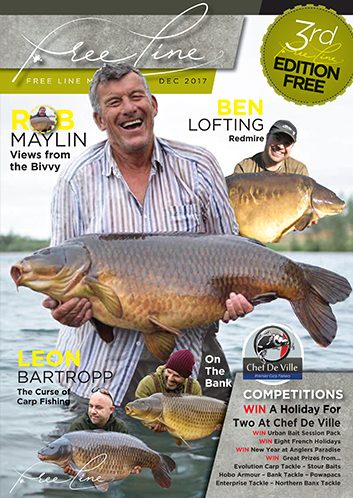 In the December edition of the Free Line magazine we feature Ben Hamilton, Sean Leverett, Steve Briggs and of course Rob Maylin amongst others. 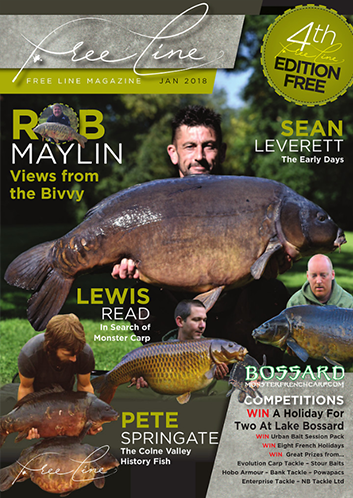 In the November edition of the Free Line magazine we feature Steve Briggs, Sean Leverett, John Claridge abd of course Rob Maylin. 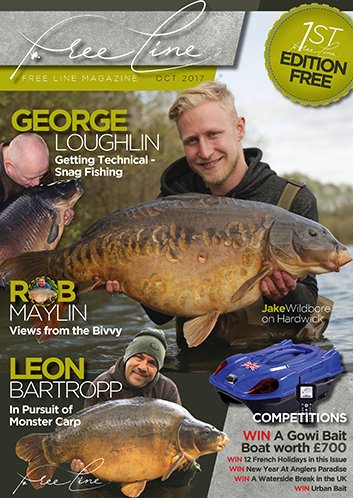 In the October edition of the Free Line magazine we feature Sean Leverett, Rob Maylin and a bit of 'Old School Carping'. One year on! 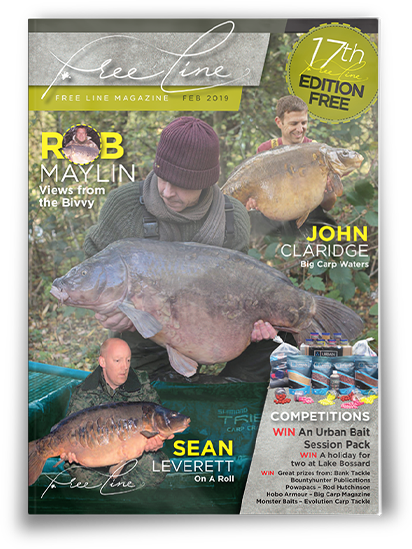 In the September edition of the Free Line magazine we feature John Claridge, Steve Briggs, Rob Maylin and Sean Leverett. 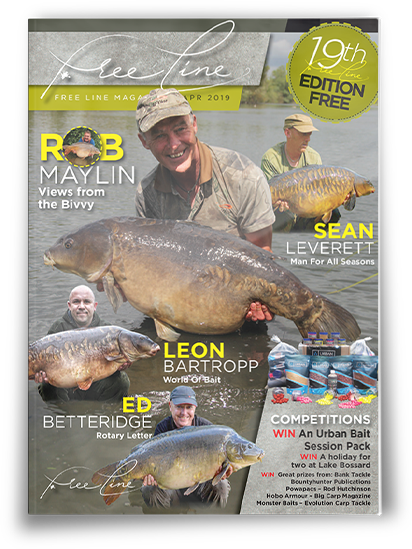 In the August edition of the Free Line magazine we feature Leon Bartropp, Steve Briggs, Rob Maylin and Rick Golder. 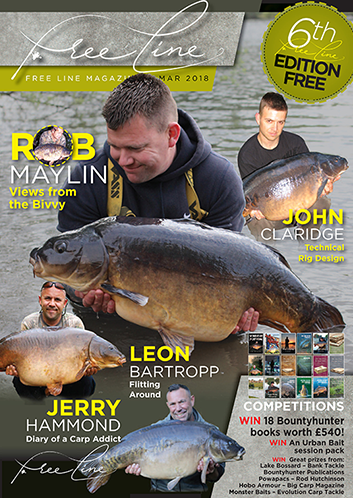 In the June edition of the Free Line magazine we feature Steve Briggs, Jerry Hammond, Rob Maylin and Peter Springate. 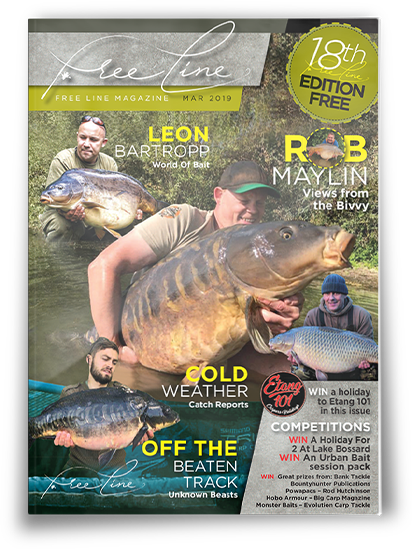 Welcome to Free Line Magazine, a new era in carp fishing magazines. 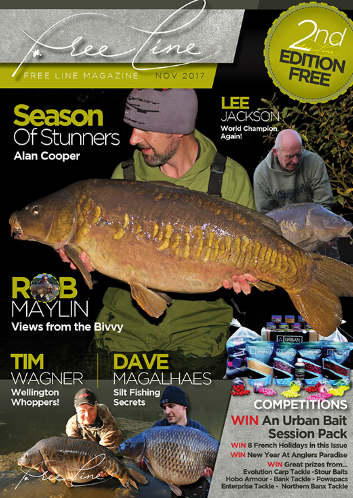 Free Line is the first ever 200 page plus, totally FREE, on-line magazine! Yes I did say FREE! 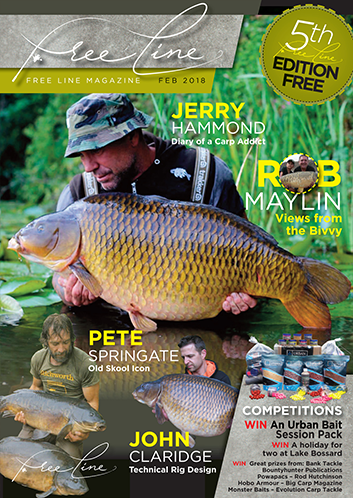 At a time where carp fishing titles are disappearing off the newsagents shelves faster than a carp attached to a 5oz lead, Bountyhunter Publications have once again stepped up to the mark and evolved with the times. 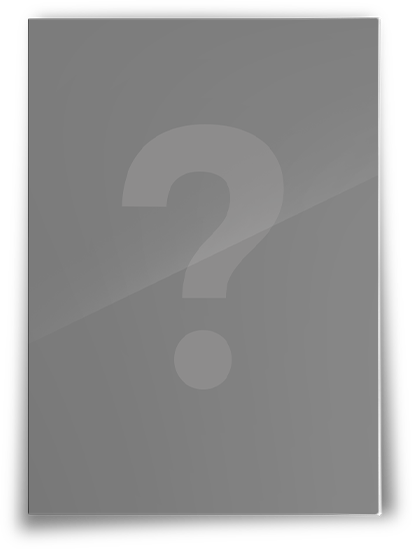 Big Carp was the first to have an digital App counterpart through Magazine Cloner, and now Free Line is yet another ground breaking concept. Why? because the age of social media is here. YouTube, Facebook, Twitter, Instagram and half a dozen more platforms already control hundreds of millions of viewers, and it's set to increase. And if you want to be seen and be read, then this is where you have to be. Free Line will contain all the aspects of carp fishing that I know carp anglers love, my 30 years as editor of Big Carp has taught me this. 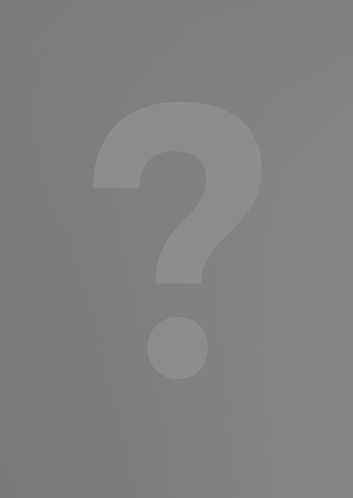 Comprehensive catch reports, un-biased catch reports, open to the public regardless of what bait company you prefer. These catch reports will be sponsored by lots of different companies all offering great monthly prizes for the best catches! Edgy Big Carp/Sub Surface style articles, so popular with BC readers. Technical pieces combined with session and campaign carping. Venue variation coving River, Canal, Syndicate and Day Ticket carping. And most important the chance for unknown successful angers to get their stories published, the unsung hero's out there doing it, rain, shine, summer and winter. The content will be a mixture of exciting new material and some classic old BC pieces from the archives. Free Line will be available via its own bespoke website and from the Big Carp website. You will be able to download it on the bank, in the bivvy or wherever, anywhere in the world FREE. You can read it on your phone or tablet, while fishing, at home or even at work. You will be able to send pictures, videos and blogs direct from Face Book, Twitter or Instagram. I hope you enjoy the new format, if you do please let us know, if you don't well please remember its FREE there are not many things in this life that are totally FREE but Free Line Magazine is! Copyright © Free Line Magazine, 2019. All rights reserved.